In 2013, the Center for American Progress conducted a study to assess the correlation between the relative strength or weakness of a state's gun laws, as measured by the Law Center to Prevent Gun Violence, and rates of gun violence in the state across 10 categories of gun violence or gun-related crimes. Consistent with the research, the CAP study found a strong correlation between strong gun laws and lower rates of gun violence. In the 3.5 years since that study, a number of things have changed that warrant revisiting that research. Many states have acted to strengthen their gun laws: Since the mass shooting at Sandy Hook Elementary School, eight states have enacted laws to require universal background checks—bringing the total number of states that have enacted such laws to 18—and 20 states have strengthened their laws to help keep guns out of the hands of domestic abusers. Unfortunately, other states have taken the opposite approach, loosening laws regarding where guns may be carried and weakening or eliminating concealed carry permit requirements. In addition, improvements made in the collection of data relating to gun violence now allow more precise tracking of events such as mass shootings and fatal shootings by law enforcement officers. 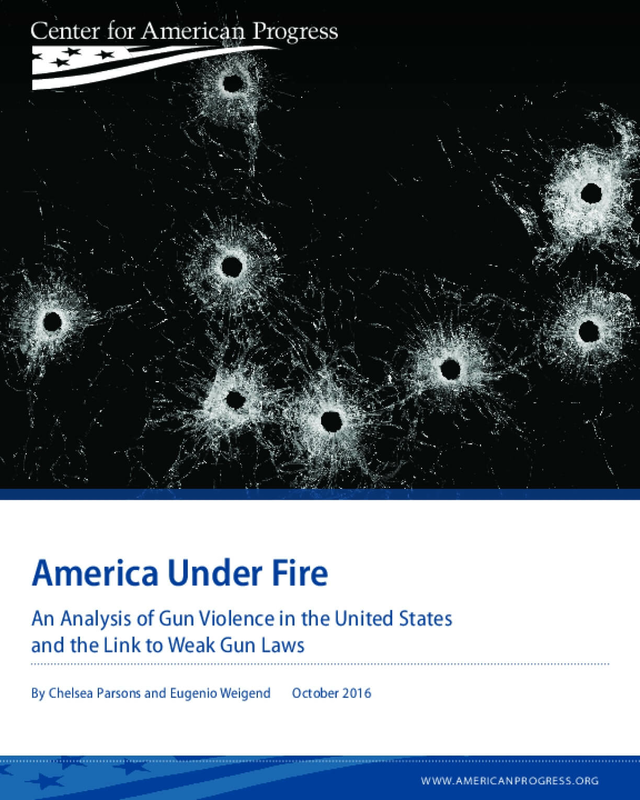 In this report, the authors revisit CAP's 2013 analysis with a revised methodology, some new categories of gun violence, and updated state grades from the Law Center to Prevent Gun Violence. The report provides a state ranking across key indicators of gun violence, then uses these rankings to calculate an overall Gun Violence Index score for each state. Using this score, the authors assessed the correlation between the rate of overall gun violence in the state and the relative strength or weakness of each state's gun laws.